It is not Nuts. It is "Mr. Orangey-Pants", who kept showing up in our driveway and was the skinniest, ribbiest, sweetest, friendliest lovebug stray ever. Finally we took him in (much to the chagrin of the 4-in-residence), fattened him up, renamed him "Rudy" (for Seanez), and turned him over to Matthew's ex-wife Marjorie, who was the lucky (and good-natured) recipient of one of Nuts and Caroline's siblings, Tiki, last summer. When she came to visit Rudy for the first time, she said, "Huh. Some ex-wives get alimony or cash settlements. 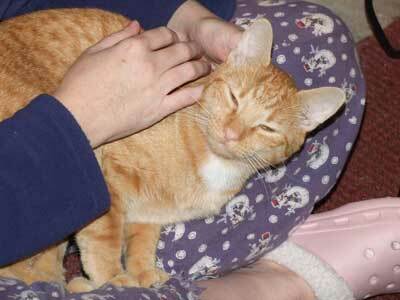 I seem to be getting a stray cat annually." Which is one of the funniest things any ex-wife has ever said. Every time we drive by Marjorie's house now (she lives 2 blocks away), Gus and I shout, "HI RUDY!" We miss him. "Hearts", also by Mochimochiland. I love her patterns. These and the Grass above are supposed to have little beady black eyes, which make them go off the cuteosity meter, but I'm too lazy to embroider right now. "Wonderful Wallaby" by Cottage Creations. Encore Worsted. This turned out to have 12" of ease, which is humongous, but apparently that makes a garment extremely cool, if you are 8. 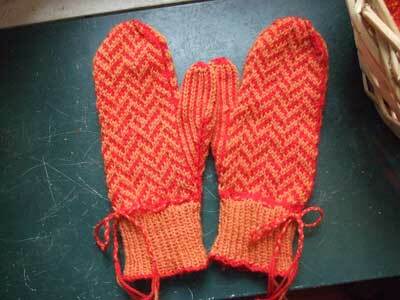 "Herringbone Mitts" from Elliphantom Knits. Knit out of Patternworks Meredith Bay yarn. The colors are closer to each other in person, if you know what I mean. I'm all about tonal these days. The orange is darker. These were fun. 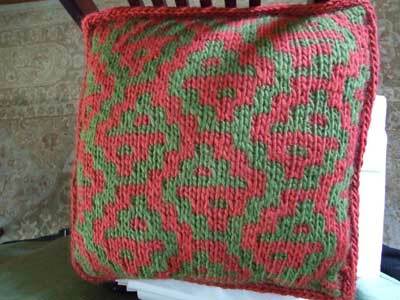 "Easy Mosaic Pillow" by Momogus Knits. In Lamb's Pride Bulky. I'm teaching a class in this for the Tangled Web in January. 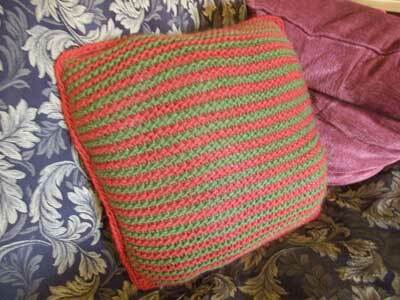 I started a similar pillow in worsted weight when I taught this class in the past, but it was too time-consuming. This took a weekend and I lurved how it turned out. 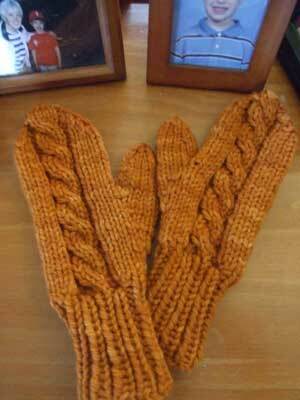 "Easy Cable Mittens" from Momogus Knits. 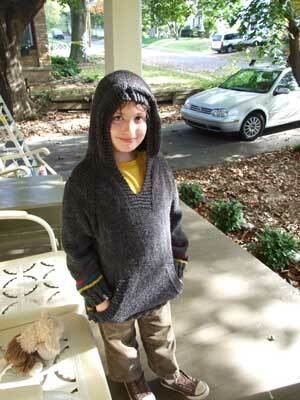 These were knit out of Malabrigo Chunky as a store sample for Loopy Knits in Chicago. 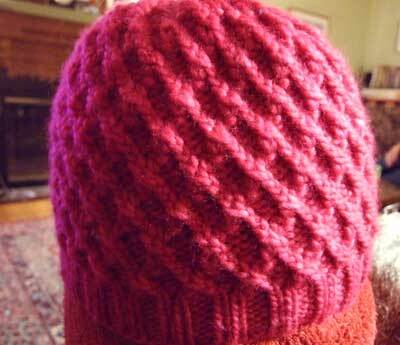 "Emma Hat" from Hip Knit Hats. Lamb's Pride Bulky. The flowers and leaves are from Nikki Epstein's Knitted Flowers. This is also for a class at the Web in February. 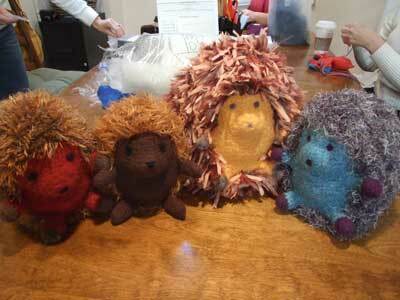 These are the Huggable Hedgehogs from a class I taught at the Web last month. The women in the class and I went out of our minds when they were all done. Mine is on the far left. WAAAAA!!!! "Koolhaas" from Interweave Holiday Gifts 2007. 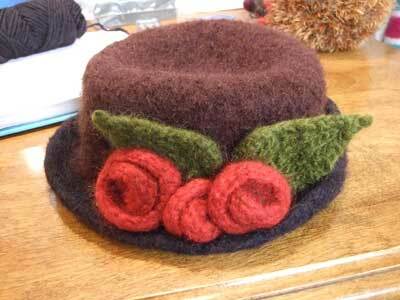 The hat that a million people have made, in Malabrigo. It was more of an intellectual exercise than a project for something I would wear. I like how it turned out, but it will probably be a gift for someone. 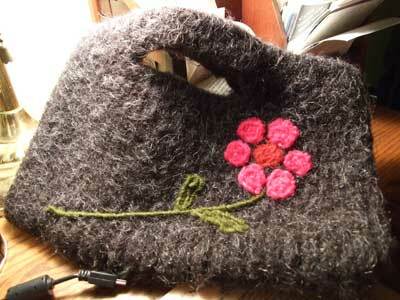 "Double-Trouble Felted Clutch" by me. 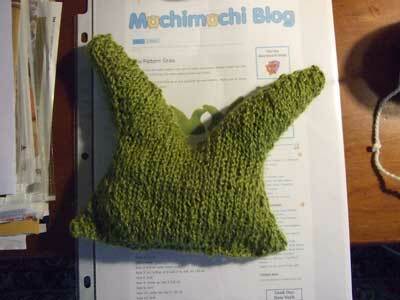 For a class I'm teaching in January and will also be an upcoming Momogus Knits pattern. 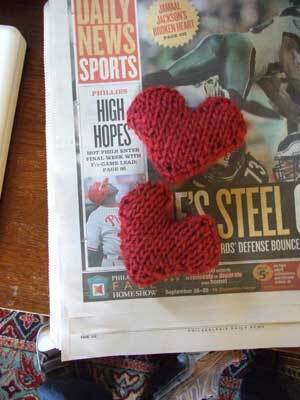 Double-knit and needle-felted with Lamb's Pride Bulky. Finished this very afternoon. I like the flower, though that seems to be the extent of my embellishment imagination. Okay, so you're all up-to-date on my recent knitting and cat projects. I was working on another store sample during the World Series, a Momogus Knits Easy Cable Scarf out of Berroco Ultra Alpaca for Village Yarn Shop in Zionsville, Indiana. What was funny about it was that in an ordinary two-hour knitting session in front of the tv, I'd probably get 3-4" done, but while watching the World Series I think I knit something like 10-12" at a stretch. It made me laugh. 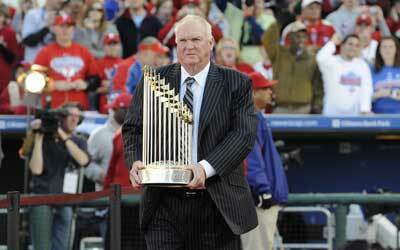 I like your picture of Charlie and that trophy. Tonight I touched that trophy, with my very own finger. Then we had a picture taken of me and Jean and that trophy. (This was at the Philly Sports Hall of Fame dinner.) Then we had a nice chat with Harry Kalas, with Chuck Bednarik, with Ray Didinger, and finally with Harold Carmichael. And I got to receive the plaque for the 1929 Philadelphia Athletics, the greatest baseball team in history, and to utter a few remarks about them (although Dan Baker, in introducing me, stole most of my lines, although they were from my write-up in the evening's program). Quite a fine evening. You're right; those Cubs didn't go very far. Can someone explain why Brad Lidge didn't receive one first-place vote for the Cy Young award? I won't argue that he should have won it, but one vote?? Mets' Santana got four, for cryin out loud. No matter, we gots the big trofee. And while I'm at it - was there any support for Chooch Ruiz as WS MVP? You could make a very strong case. Cole was great, but I don't think I've seen a Phightins' catcher play that well on both sides of the ball since Dutch. And before that, maybe Boone. gg - can't wait to hear the details! it is awsomely cool that you got to touch the trophy!!! sandy - yeah, i bet you're very sad about that!! go brewers! ks - lots of great starting pitchers this year, but Lidge's performance was definitely Cy-worthy. I don't have a quibble with him not winning but like you I don't understand how he didn't get more (or any) 1st place votes. And i'm TOTALLY with you on Ruiz. I guess Hollywood Hamels was a little more noticeable. Ruiz really changed my mind this season. Choooooch!! I noticed on your Ravelry page that you are from North Hills. I grew up there. Sure do miss the old hometown.